PixelBerg beta has been updated to version 1.7 and is available to purchase now. pixelberg v1.7 NOW IN APPLE FLAVOR! If you made a purchase of Pixelberg in the last 14 days you will receive new download links via email (If you dont recieve an email within 24hrs then please contact me with your original order details). However if you are outside that timescale you will need to purchase again at whatever price you see fit for the latest version. I hope people will see it as supporting the project and not mind putting a couple of dollars into the collection tin every now and then to help aid future development. The main feature of this release was always going to be bringing pixelberg to the mac and pixelberg is now compatible with c4d r15 ,r16 and above on macs. Basic parallax occlusion mapping (pom) has been added to 1.7 and is accessible on the bump tab of the material. * I will probably look at also adding shadows and a silhouette pom implementation in the near future. Parallax occlusion mapping is a form of "virtual displacement" that is it provides the illusion of displacement by altering the uv position without creating any new geometry. However all parallax mapping techniques suffer from some very nasty artifacts if you push them to far or view from oblique angles. The technique works really only/mainly on large flat areas for example walls or floors. Because of these limitations i am not a huge fan of pom as its only suitable in very few limited situations. So why did i add POM if i am not overly keen on it? If used right it can be effective and there is also one area that i do like using pom which is to make quick realistic eyeballs. I think i first saw square enix doing this and it works in my opinion very well. 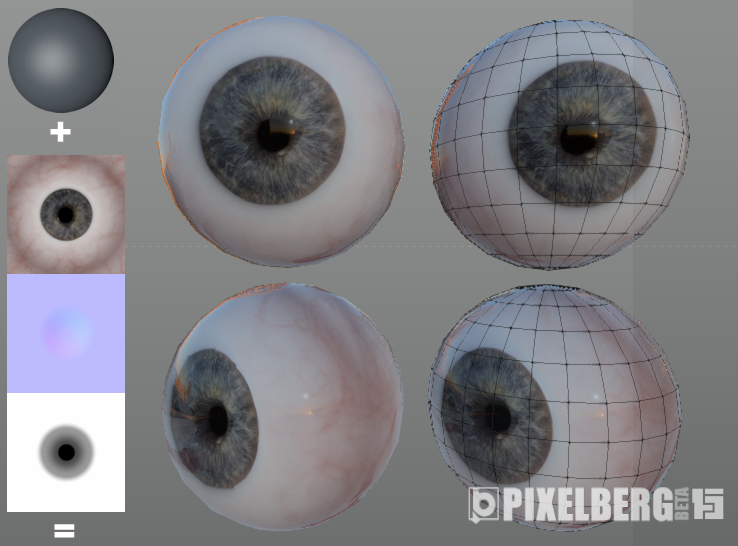 Due to the way parallax mapping works it makes very nice/realistic eyeballs with only a simple sphere and 3 maps. I will try and cover this more in depth in a future post but the above quick test should give you the basic idea. Pom is a switch on the bump map tab that will switch from standard bump to pom. The bumps settings of texture and intensity will be used for pom. Clip Pom: Clips any values that lie outside of the uv range - useful in a few situations for very basic simple silhouettes. Hopefully this will eventually be changed to proper silhouette pom. Here are a few of the more general improvements that were done. Initial support for substance plugin -Understandably the substance plugin was built with c4d standard materials in mind only. Unfortunately that meant that in pb 1.5 when you changed an assets params pixelberg would not know and thus not update the viewport textures. In 1.7 the textures will be updated if needed on the next viewport redraw or pb material update- while not perfect this makes the substance plugin useable/workable with pixelberg however i am waiting to here back from someone so expect further improvements here. Sky creation has had a minor tweak/optimization where down-sampling is done pre-filter. The Sky creation is currently still cpu bound so expect further improvements when its moved to GPU. Layer Shades will no longer cause a crash however they are no longer sampled threaded. Fixed a minor issue where if a material was not present in scene on document open its preview would not be generated correctly. Fixed an issue with alpha that caused objects to appear slightly transparent when they shouldn't be. Removed metalness clamp the metalness lower (as per he original paper) bound was clamped above zero in previous versions- This clamp has been removed for better compatibility with other PBR implementations. As people always ask whats planned for the next update i thought i would make a note here of what i have planned next. Next up will be the off-line render support and sky improvements. #1.7 : MAC version added. Minor tweaks and fixes, initial substance plugin support, basic parralax occlusion mapping added. #1.4 : DOF post added, sky plane material added, general fixes and improvements. #1.3 : Fixed Post Shader Error on NVidia. #1.2 : R15 support, metalness map support, improved ssao, improved sky creation, vignette post added, hardware render fix, general fixes and improvements. #1.1 : Fixed Shader Error Display Issue. I forget to mention that the display in the preview window is good.